Since we are now in the middle of the final month of a quarter, checking repo stats shows what we have come to expect of a fragile liquidity system. 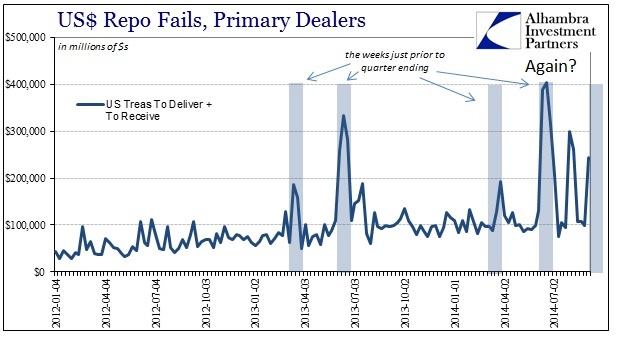 Once again, repo fails spiked sharply in the latest weekly statistics from FRBNY as primary dealers and the Fed’s own repo “fix” fail to affect the “resiliency” that FOMC members appear desperate to attach. However, since the repo market is far, far away from the everyday nobody pays much attention. The problem with liquidity is always that it’s not what you see today when all seems well and abundance is seemingly effective, it is actually what to expect when you need it most. From the standpoint of central banks, that has been their operating assumption (at least as portrayed publicly) since the nineteenth century. The Federal Reserve itself was dedicated on the principle of currency elasticity, which is exactly this point – to be that liquidity when it is most needed as private markets shy away. The message of resiliency is then a main part about incorporating those shortcomings into the current framework. When Janet Yellen proclaims that markets are so “resilient” that she would prefer they not even bother about such negativity she means to say that the Fed is more than aware of flow and liquidity and has taken that to heart. Indeed, they instituted the reverse repo program (actually it was just an expansion of existing lines) last year to live up to elasticity doctrine in the real “currency” of the modern bank: collateral. There has been a noticeable uptick in reverse repo usage in the past few months, but nothing that would suggest anything awry. Outside of the surge in May, there is a seeming straight line upward trend that was established all the way back when the Fed first tapered in December. In that important respect, there does seem to be some correlation with reverse repo usage and the repo market. That includes the very important changes that have taken hold of repo volumes in US$ terms. While focus is often placed on UST collateral, MBS repo was at least astride UST in terms of size and volume. That changed quite a bit after QE3 began as you would expect given how QE strips the “market” of needed and usable securities. 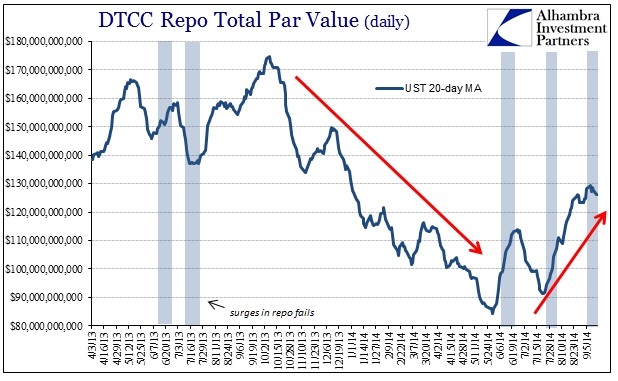 However, we can also see this same imprint in the UST repo market as well. Again, that makes sense given that QE4 was instituted to take UST collateral, a topic that has gained actual attention in the past eighteen months (including a very needed adjustment to the Open Market Desk policy almost from the start). 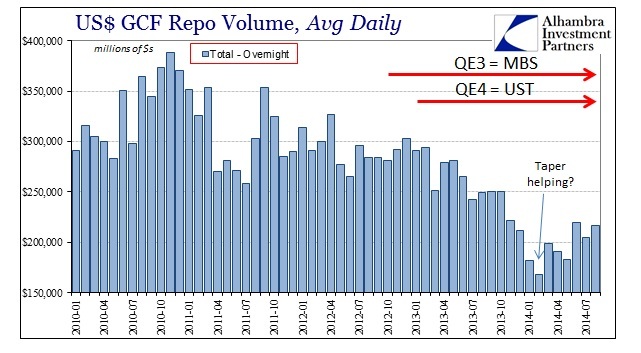 From these figures we can reasonably assume that where QE was impactful in turning repo volumes lower, its taper has accomplished the opposite. In addition to the very real concerns of secular stagnation and asset bubbles, rather than how the economy actually exists right now, these repo “costs” are a major factor in the impetus toward the monetary exit. However, like everything else with monetary intrusion, simply ending the manipulation is not the same as never having undertaken it. 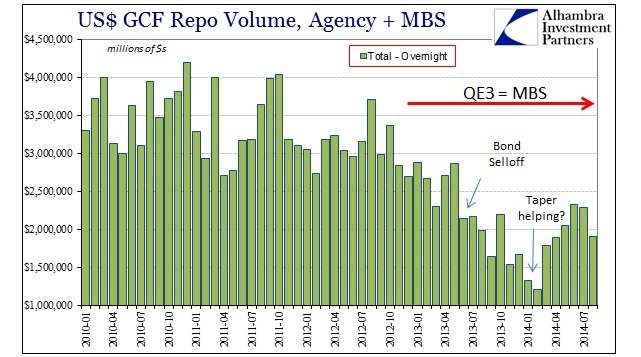 In another example erasing the figment of monetary neutrality, there is a clear diminishment in repo capacity and thus “resiliency” on this side of the QE taper. The change in repo volume since the middle of 2014 has been significant, but only just now approaching levels that would be considered “normal” last year (and before). Yet, for all that additional volume there has been a repeated signal of distress through fails. There was the major episode in June just as repo volume had turned upward, and then again in July as the same occurred. 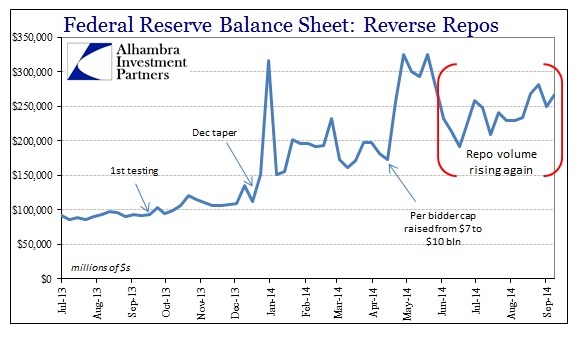 And, as I noted at the beginning, we are now in the third major instance of a fails problem (without any corresponding surge in reverse repo usage that was “supposed” to occur if the Fed’s “fix” were anything like one). What we are left with is much worse than when this all started. 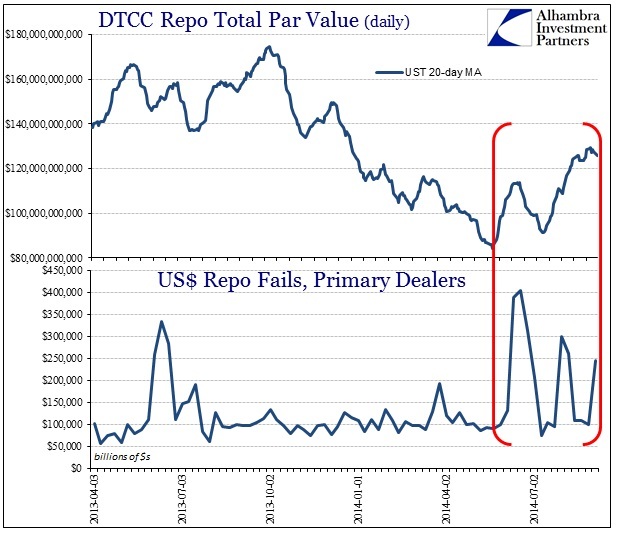 The problem of QE in repo terms was that it not only stripped usable collateral from dealer inventories and from other holders where it might be used as supply, it has seemingly diminished the entire repo market’s capacity to withstand even a relatively minor increase in volume. What was normal in 2013 seems to create something of a stir in function in 2014. That these are mostly clustered around quarter ends continues the systemic weakness that has been apparent in every major market “event” of this period, adding to the judgment that “resilience” is nothing but PR and wishful thinking. The problem for “markets” is that this is a primary liquidity conduit indicating significant and persistent degradation under, again, very benign conditions. In my analysis, there is no doubt that QE is the primary culprit here and that its removal is not “allowing” a healing process to begin but instead revealing the damage. With the Fed’s reverse repo program having no input whatsoever, it just adds to the weight of evidence that policymakers don’t really know what they are doing and are just making it up as they go. With compliant media that gives total deference to orthodox economics, the speeches and soundbites are enough reassurance to stave off much needed inquisition. For now.